On Tuesday, I spoke in Savannah, Georgia at the Family Education for Christ yearly kickoff event, which marks the beginning of the academic year for many homeschoolers. I spoke at the same event about six years ago and was excited to come back this year. The city of Savannah is gorgeous and steeped in history, and the food is amazing. 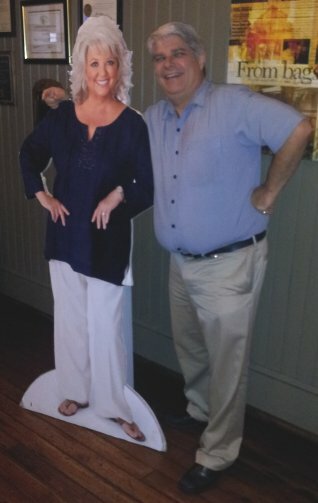 Speaking of food, before the event, my wonderful hosts took me to The Lady and Sons, which is Paula Deen’s restaurant. The food was nothing short of incredible. It started with hoecakes and garlic/cheese biscuits. It was followed by pulled pork, which had probably the sweetest barbeque sauce I have ever tasted. I was then “forced” to eat dessert, which was banana pudding mixed with vanilla wafers. As you can see from the picture, I am no stranger to eating a lot of food, but this meal filled me to the brim! After lunch, we took a driving tour of the city. The historic section is filled with squares that hold plant life and monuments to famous people or events. What makes the city gorgeous, however, are the trees that fill the squares and line the streets. Many of them are covered with Spanish moss, an epiphytic plant. This means it grows on trees but does not act as a parasite. Instead, it just gathers water from the air and from rainfall. The moss hangs down from the trees, producing the illusion that you are in a deep, medieval forest, even though you are in the heart of a city. Eventually, however, all this wonderful tourism had to come to an end. After all, I had a job to do. The crowd at the kickoff event was big, and it was full of appreciative people. I had one homeschooling mother thank me for encouraging critical thinking in her students as well as Christians in general. Another homeschooling mother told me that her son was majoring in biology at university specifically because my books had fostered such a love of science in him. Another mother said that she made her decision to homeschool through high school because of the talk I gave in Savannah six years ago. I cannot express how much the words of these mothers encouraged me! I was asked to do a talk that was part encouragement and part “nuts and bolts,” so I blended two of my standard talks together. The first half of the talk was about homeschool graduates and what they are doing now. I shared statistics that show how homeschool graduates are significantly more successful at university than their peers and that most of them recognize homeschooling gave them an advantage in their endeavors as adults. I also highlighted some homeschool graduates I know personally, demonstrating how homeschooling helped them to follow the Lord’s leading in their adult lives. After a short break, I gave the second half of the talk, which discussed what subjects should be covered in a university-preparatory high school experience. It also gave pointers on how to cover those subjects and how to keep records so that a solid transcript could be made. In the end, the blend seemed to work really well, as many of the parents expressed gratitude for the mixture of inspiration and practicality. As always, I took questions from the audience after the talk, and most of them were very practical in nature. The first question was about reading. How did I decide what my daughter should read for high school English? As I told the questioner, I know virtually nothing about literature outside of science fiction and fantasy novels, so I looked at several universities’ websites for their recommended reading lists. I then compiled a master list of books that was far too long for any reasonable student. I gave the list to my daughter and told her that we were going to read four books from that list each year, and she could choose which ones they were. That seemed to work really well for her and for me. I thoroughly enjoyed my time in Savannah, not only because the event went so well, but also because the people were incredible. At dinner after the event, I sat with several homeschooling parents and literally laughed until I cried as I listened to them talk about their homeschooling adventures. The Lord is working mightily in the homeschooling movement around the world, and in my opinion, what is going on in Savannah is great evidence of this. I am so jealous that you got to go to The Lady and Sons. It’s been on our wish list of restaurants for a long time. Sounds like you had a great time in GA.
It’s definitely worth going to, Rusty! Today my youngest sister discovered a strange fruit on our neighbor’s cherry tree. It was about an inch and a half in diameter, the color of a red grape, and speckled green on the bottom, somewhat like an Asian pear. It looked a lot like a small plum in shape. The pit was rather like a large cherry pit, not flat like a plum’s, and the flesh looked like a red plum’s: light yellow in the middle and darker red toward the outside. We tasted it (ah, those homeschoolers) and we are not dead yet. It tasted like a cross between a plum and a tomato. It definitely had that acidic tomato taste. I didn’t think it tasted like a cherry at all. This particular tree fell about seven years ago, and has been slowly dying since then. There are many tomato plants around, but no plum trees that I know of. Is cross polination possible between a cherry tree and a tomato? Especially seeing as the tomatos were planted after the tree bloomed. Just wondered if you (or anyone else) had ever come across anything like this. I’ll tell you if anyone dies, lives forever, or suddenly has an uncanny knowledge of good and evil. Grace, I seriously doubt cross pollination is the answer. Cherry trees have 46 chromosomes. Tomato plants have 24. I can’t imagine how organisms with such different DNA could possibly reproduce together. I wonder if the odd fruit is the result of the tree dying. I would think that because it is dying, it can’t make some of the necessary proteins in needs to produce a proper fruit. As a result, I personally think you ate a cherry that had some vital ingredients missing. It certainly tasted like a tomato. And it was larger than a cherry and looked nothing like one. Also, none of us are dead yet, in case you were wondering. I guess I can’t help you on what it was, Grace, but I am glad there were no deaths!